MSNBC: Why do you think [“It’s a Wonderful Life”] appeals so broadly to people 70 years later? Karoyln Grimes: It’s timeless because it applies to yesterday, it applies to today and it applies to tomorrow. We all have banker problems. We all have issues. We can identify with the ups and downs that poor George goes through. We can identify with the fact that his dreams that he had for himself never came true. And it also identifies with the fact that as long as we have faith, family and friends – you know what – we’re good. How did this part come along and do you remember anything about auditioning for it? Let me just run through a few names for you … James Stewart. KG: He was about six feet four. He was real tall and he was just a really gentle person who had a lot of patience and who was very calmed. Tell me a little bit more about his personality. KG: He was a quiet man … this was right after World War II and I think he was changed a little bit. And he just was a very nice man. And in later years, we got together again and he was still that nice man and he still helped his fellow man … he just did a lot of things for people that he didn’t need accolades for … he was George Bailey. Did you bump into Lionel Barrymore at all? KG: Yeah, a couple of times … He had some sort of a sickness and he was actually in a wheelchair and they built the part around him being in that wheelchair. KG: He was a very gentle man. And he asked for you to do things and he got down on his hands and knees, looked you right in the eyes and said “this is what I want you to do.” And so he got what he wanted out of you that way because he was eye level and he wasn’t looking down at you and he just knew what to do … and he wasn’t like a stickler to stick to every word in the script. He was kind of easy about that. If you didn’t get each word exactly right, it was OK. Some directors weren’t that way. Do you remember what you got paid for the film? Whoa! What did you do with the money? Were you allowed to spend it? KG: Oh, heavens no. That went right to the coffers of my family. What’s something that people watching at home might never guess about this film? KG: Maybe how the snow was made. It was made with fomite and Ivory soap flakes and sugar and all kinds of things. So when you watch the movie, you’d see suds going around. This was California so it was warm anyway, but what time of year was this filmed? KG: It started in April and they finished about the first of August and it was extremely hot. They were having a heat wave. It was 95 degrees. Was Capra someone that did a lot of takes? KG: Yes, yes, yes, yes, yes. He shot 350,000 feet of film and he only used 11,900. It wasn’t this huge box office hit. What do you remember about the actual release at the time? Or did you even think about it? KG: It was just another movie … I didn’t even think about the fact that it was or wasn’t a hit. I could have cared less at that point in my life … it was just a job … I went to the opening night but I fell asleep. A lot of people have only known it as the ultimate Christmas movie … a lot of people don’t realize probably that no one thought twice about it for years and years. KG: That’s true … They didn’t think a thing about it … they didn’t renew the copyright so it sat on a shelf 20 some years. That was what really helped it along because it was free and all the TV stations could show it. And they showed it over and over and over again. And that’s how they got exposed to the film. Pretty soon people found me and wanted to interview me … and I started getting fan mail. And I thought Jiminy Christmas, I better check this movie out. What’s the best part of being connected to this movie? KG: Meeting the people. I love it. Just talking with people and sharing part of their lives for just a few moments … I get love and appreciation and I hope I give them the same. 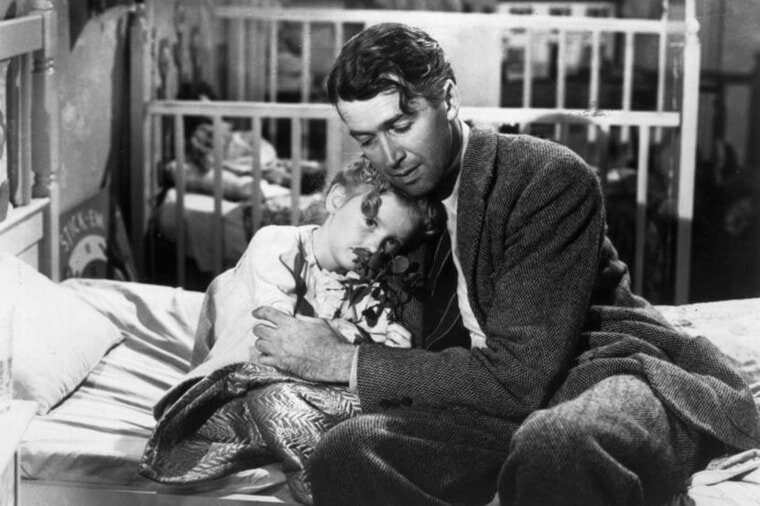 “It’s a Wonderful Life” airs Christmas Eve at 8 p.m./ET on NBC.